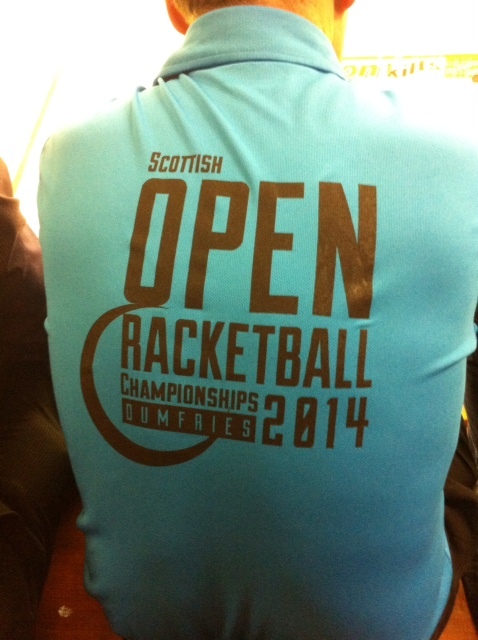 New Canada Lands – Glasgow v Canada Match April 2014! 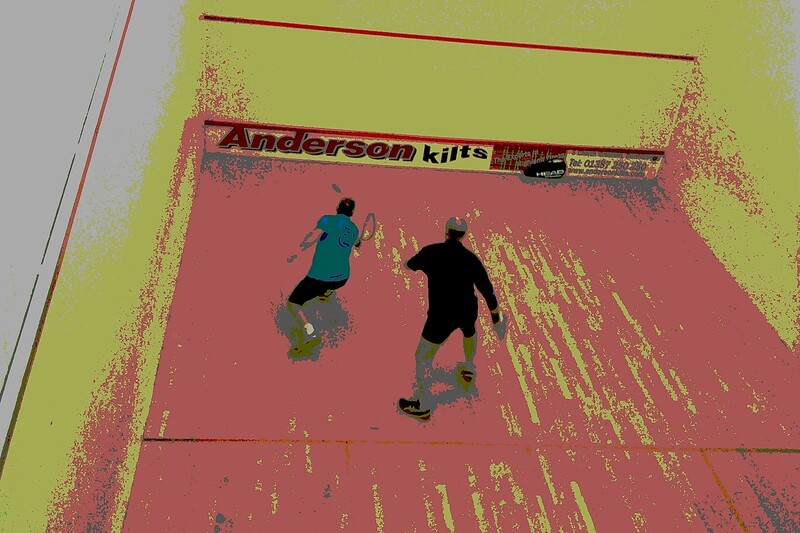 A Canadian Touring side came to Scotland for a 2 week squash tour of the country and their first stop was Glasgow’s Newlands for a 10-a-side friendly match (well as friendly as these things get on court!). The tourists won a hard fought contest with a team of Rex, Brad, Zack, Tyler, Ethan, Francois, Jean-Cristophe and other great Canadian names! We (Newlands) were captained by Mandy Nicol and the team line-up included me, Pete Cumine, John Singh, Graeme Marshall, Iain Donellan, Pete Cumine (sen), Bernard Dunn, Colin McIntyre among others. It was a great match up and the apres-squash was as good as the match – we even took them to the West Squash End Of Season Presentation night at Giffnock (where Craig Brown was the guest speaker). Squash touring is the future in my book! Right who’s up for the return? Greg Gaultier has returned to World No.1 for the first time since Nov 2009 and his intention is to stay there this time. On the 1st occasion he was on the top spot for just one month and in an incredible turn of events he held the first ever joint No.1 position in February of this year when he joined Nick Matthew at the top. But April see’s Greg take the title solo, by just 180 points, with a win in the Windy City Open in Chicago in early March. Nick Matthew will no doubt be determined to challenge Greg for the World No.1 spot next month, but both players will have to look over their shoulders as Mohamed El Shorbagy has hit a career high of No.3 which is an amazing result for the 23 year old from Egypt. 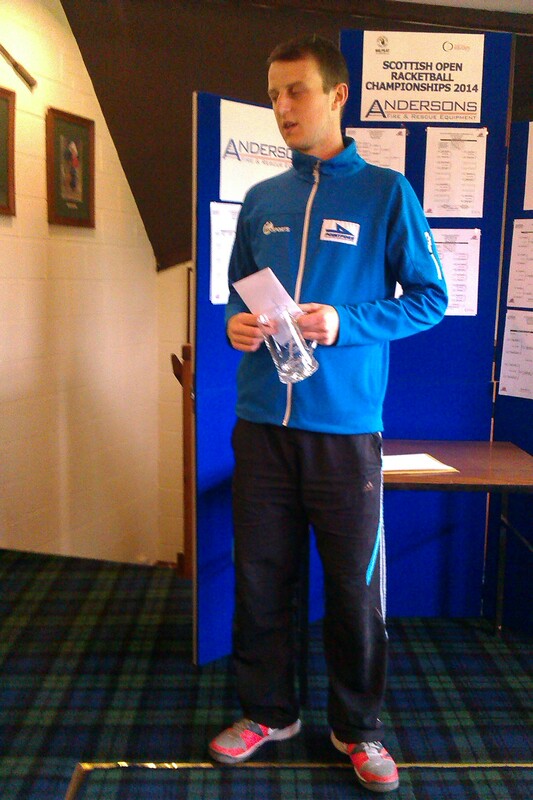 It’s also good to see Scotland’s 2 Harrow stars moving up Alan Clyne at No.37 (up 1 place) and Greg Lobban at No.75 (up 2 places). The last two weeks has seen the Whitecraigs LT&SC 2014 Club Champions crowned and in the Men’s Tournament there was a hell of a final between Iain McDermott and Steve Luker. Steve took the early exchanges and won the first two games and looked in total control. He volleyed well and didn’t let Iain have a sniff of the ball let alone the ‘T’. But Iain is renound for coming back from some pretty tight situations and that’s exactly what happened in this match. He began lengthening the rallies and getting Steve behind him. He also began reading Steve’s drops much better and crunching them to a length any time he saw them. So 2-1 soon became 2-2 and so to the 5th! By now you could see that Steve was tired, but so was Iain. It was still anyone’s game to win. 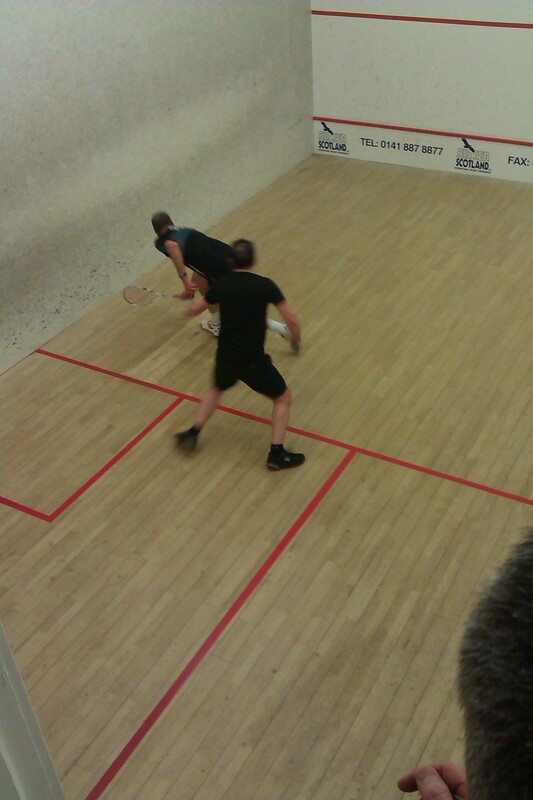 Steve needed to control the match more and find the corners and Iain needed to keep doing what he was doing. The crowd was deep in discussion about who would do it. The 5th game was another high paced affair and as Steve faded Iain powered on to take the match and become the 2014 Men’s Champion. It was a great match to watch. The Junior Club Championships were played the next week and this was a good quality tournament played as a round-robin. It all came down to the final match between Oliver Millen and Mark Taylor. 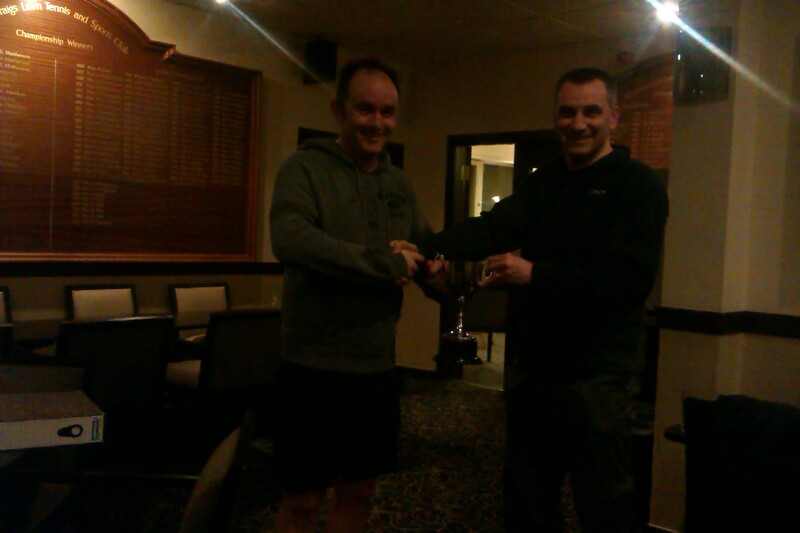 Both players had maximum points going into the final so it was winner take all. The final was a great display of determination and power. Both lads love to wallop the ball and both hate losing to each other (despite the fact they’re friends). Oli was nervous and Mark was determined to run everything down. However a season in the Wednesday Men’s teams proved to be the difference in this match as Oli was able to move Mark around the court and keep him in the back. 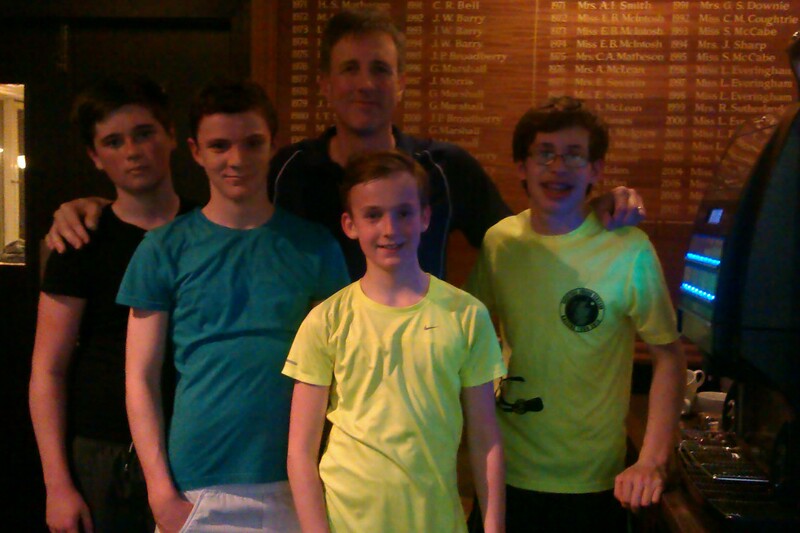 Mark did run many of Oli’s shots down, but in the end Oli was just too consistent and too experienced as he won the match 3-0 and became the 2014 Junior Club Champion. Laura won a 5 set thriller 11-7 6-11 11-9 5-11 11-9 in the final against Nour El Sherbini (and her opponent had put out the World No.1 Nicol David in the semi-finals also in 5 games).